“Füllt mir das Trinkhorn! Reicht es herum. 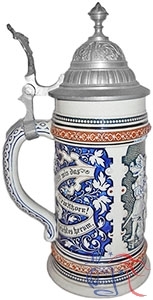 (Fill up my drinking horn! Pass it around. Text is the first verse of a song (“Füllt mir das Trinkhorn”) written by	Friedrich Martin von Bodenstedt (1819 - 1892).